Big Eagle, Skidigate. 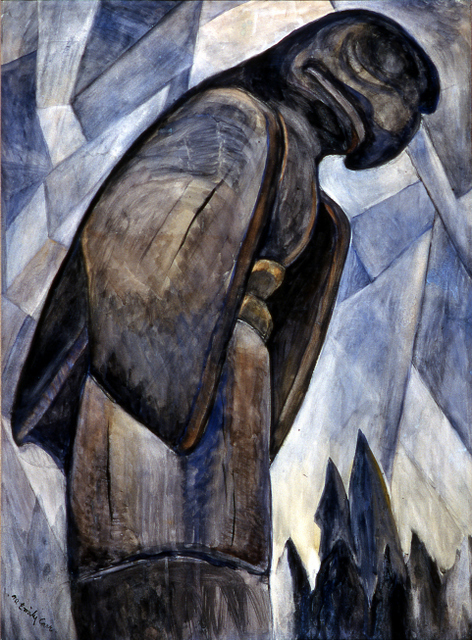 Totem poles were one of Carr's favourite subjects to paint. Art Gallery of Greater Victoria. 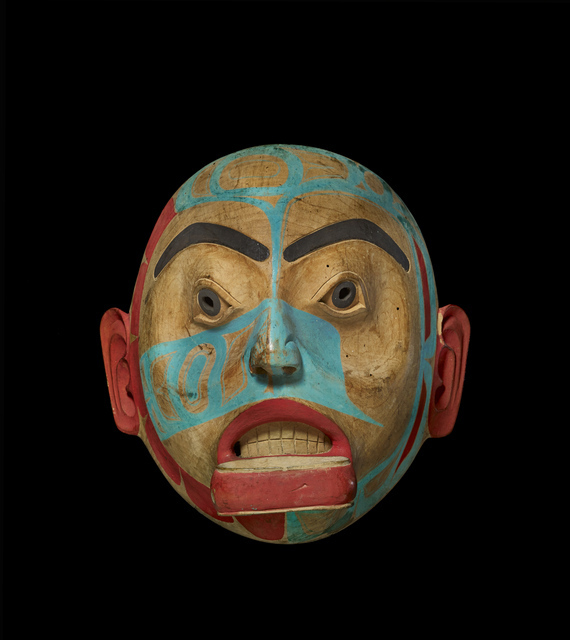 Mask, Northwest Coast Peoples, Haida, North America. One of many indigenous artefacts on display. Indian Church. The straight lines of the church contrast with the trees behind - a corollary for the contrast of Western and indigenous cultures. 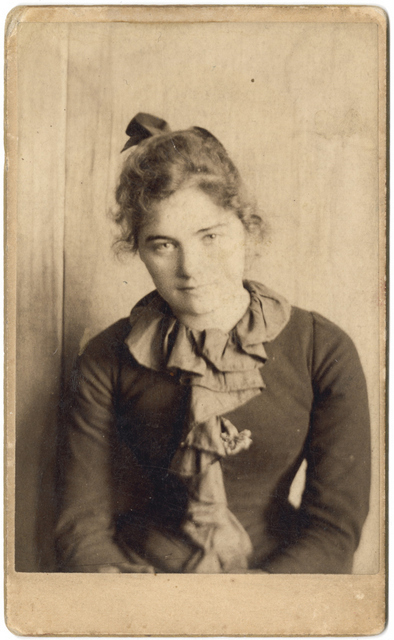 Emily Carr in San Francisco. After this photograph was taken she travelled to Europe to develop her painting style. Courtesy of the Royal BC Museum. Indian War Canoe (Alert Bay). One of Carr's works in a Fauvist style. The Montreal Museum of Fine Arts. 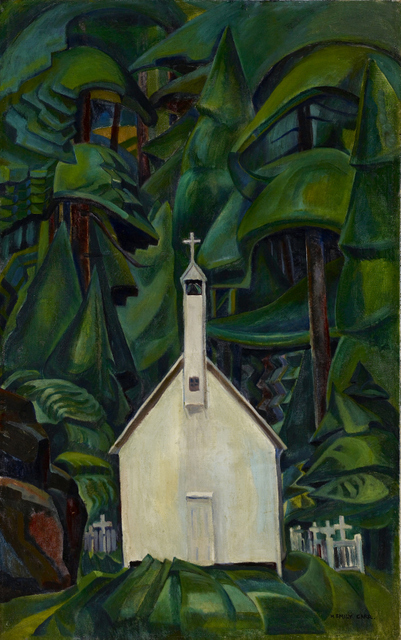 Following on from their excellent 2011 show Painting Canada, Dulwich Picture Gallery has laid on another exhibition of Canadian art — From the Forest to the Sea: Emily Carr in British Colombia. It's a solo outing for 20th century painter Carr's work — her first ever in Europe. Carr was concerned with the plight of the indigenous people of British Columbia and their rapid disappearance as settlers began to thrive. This clash of cultures is summed up in one of her landscape paintings in which a white, straight-edged church seems at odds with the flowing lines of a verdant forest behind it. The artist was particularly captivated by totem poles, and there are several representations of these in the show. The most striking is of a raven — its sweeping, sleek lines contrasting with the colourful flowers below it and the rolling clouds above. Another eye-catching work is a painting of the Zunoqua (wild woman of the woods). The totem is painted with such pronounced facial lines that the aggression is palpable. Alongside paintings, the exhibition contains two sets of artefacts from the indigenous peoples including masks and various ceremonial spoons, bowls and ladles. 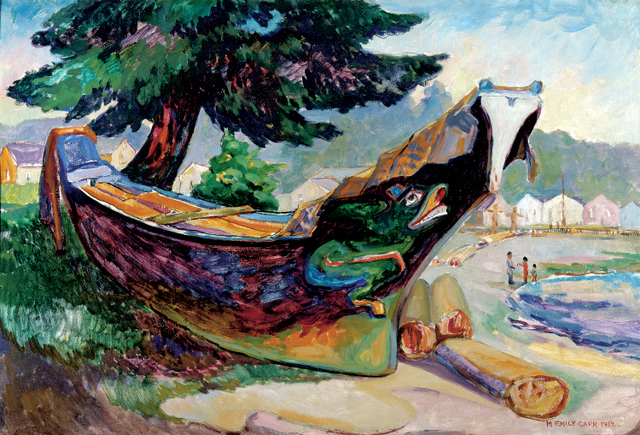 Emily Carr was a constant experimenter, trying her hand at Impressionism, Fauvism and Cubism. Though she will never be considered among the greats of any of these genres, there's a freedom of expression in her loose painting style that's refreshing. The works in this show aren't consistent in quality, and the oil paintings are much stronger than the watercolours, but the exhibition offers insight into Canadian indigenous culture, and in Carr, offers up a talented artist we hadn't come across before. 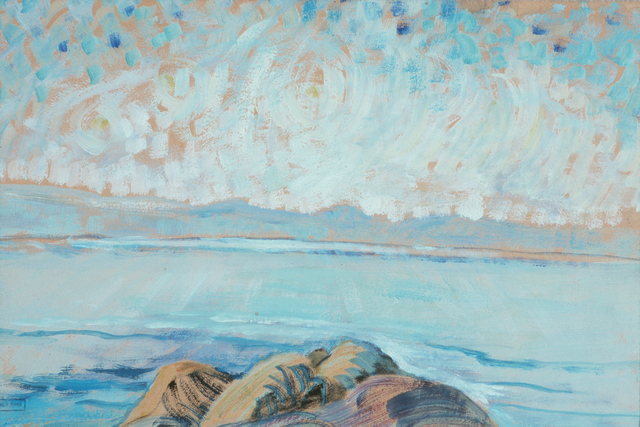 From the Forest to the Sea: Emily Carr in British Columbia is at Dulwich Picture Gallery, Gallery Road, SE21 7AD from 1 November until 15 March 2015. Tickets are £11 for adults and includes admission to the permanent collection. For more great art in London, visit our October listings.